The 5th Annual Juneau Alaska EV Round UP was another great National Drive Electric Week. 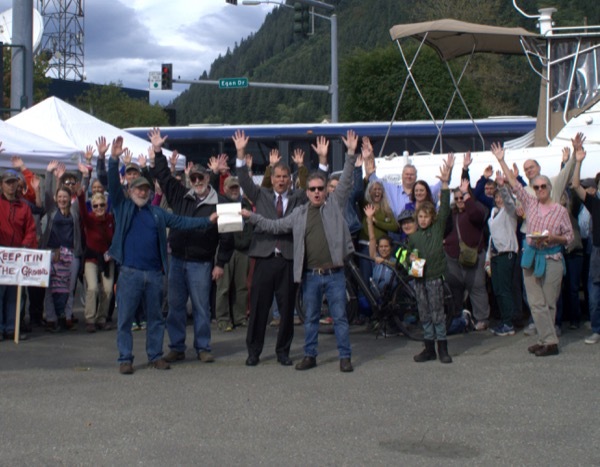 In addition to great EV displays, test rides, and information, we received a City and Borough of Juneau EV proclamation commemorating National Drive Electric Week as well as Juneau's electric transportation transformation. Many local elected officials participated in this year's event and we also displayed one of Alaska's first electric boat along with many electric bicycles. Juneau recently received a $1.5M grant from the US Dept. of Transportation to purchase electric buses and this information was also shared at the event. Our local sponsors shared hamburgers, hot dogs, refreshments and the weather cooperated with an awesome day. Juneau appears to be the most Northern National Drive Electric Event in North America for 2018. Drone Photo of the Juneau 5th Annual EV Round Up event as the event was ending. National Drive Electric Week Juneau. Juneau is one of the fastest growing, highest per capita EV cities in America! Come join the fun and learn why Juneau is EV ground zero in Alaska. Family EV event with Juneau Teslas, LEAFs, Bolts, Volts, KIAs, Mercedes, local modified EVs, as well as a host of new EV models hitting Juneau's streets every day. Where: 300 Egan Drive. Juneau District Heating Parking Lot right across from Centennial Hall. Downtown Juneau. Drone video...get your EV in on the action. EV Information, Charger Information. JUNEAU ELECTRIC BUS INFO! Why: Juneau as Alaska's Capital City supports National Drive Electric Week helping lead Alaska to Electric Transportation transformation. Registered attendees report 838,832 electric miles driven.